Fletcher-Sinclair Mansion, New York, USA, October 20 2015 – Props and costumes from Stallone’s famous films such as “Rocky,” “Rambo” and “The Expendables,” along with some of his personal items will be sold at auction in Los Angeles, December 18-19, 2015, by Heritage Auctions with a portion of the proceeds going to charity. The Props are available for the public to see at Fletcher-Sinclair Mansion in New York City. One of the biggest movie stars of the world, actor, writer and director Sylvester Stallone — the only actor with the distinction of opening a number one film across five decades — will offer fans a chance to bid on more than a thousand iconic costumes and props from his famous action films, including the “Rocky,” “Rambo,” and “The Expendables” franchises. 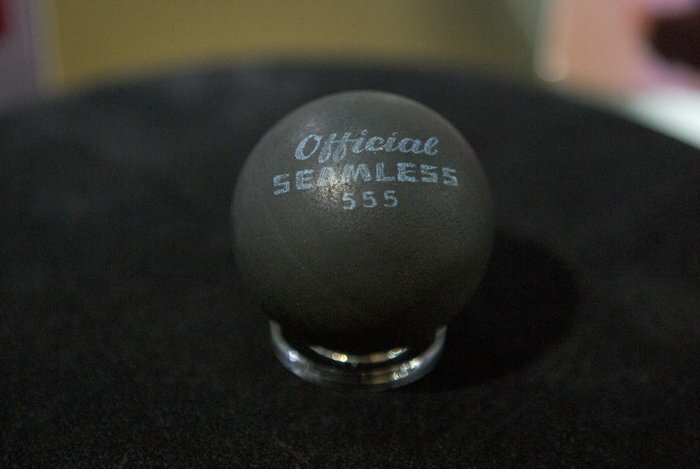 A portion of the proceeds from the auction, to be conducted by Heritage Auctions , will be donated to charities and organizations that assist veterans and wounded United States servicemen and servicewomen. 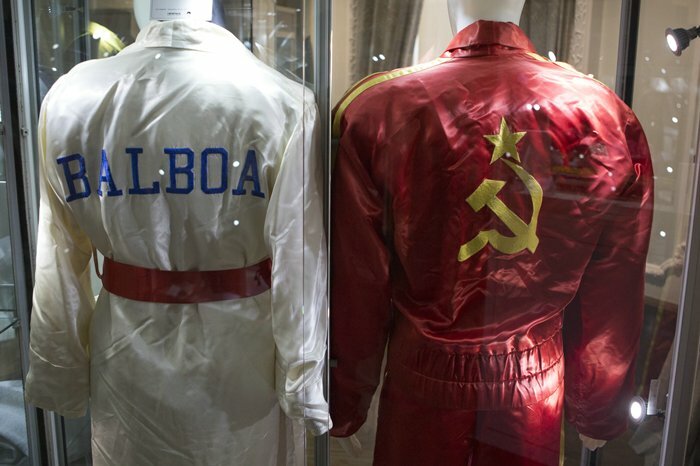 Regarding his consigned items, Stallone said: “I thought other people would really appreciate the memorabilia. So, rather than keep it all in storage I thought I should just pass everything on,” he explained in an interview for the Fall 2015 issue of Heritage’s The Intelligent Collector magazine. There will be public exhibits in Dallas, New York and Los Angeles this summer and early fall of selected items consigned by Stallone. The auction will be held live and online by Heritage in Los Angeles on December 18 and 19, 2015. “There are more than 1,400 props, costumes and personal items consigned by Mr. Stallone that will be available to his fans worldwide. He is an international superstar, and these items include some of the iconic, cultural symbols of clothing and props from his most famous and loved action films, the ‘Rocky’ and ‘Rambo’ series,” said Greg Rohan, President of Heritage Auctions. 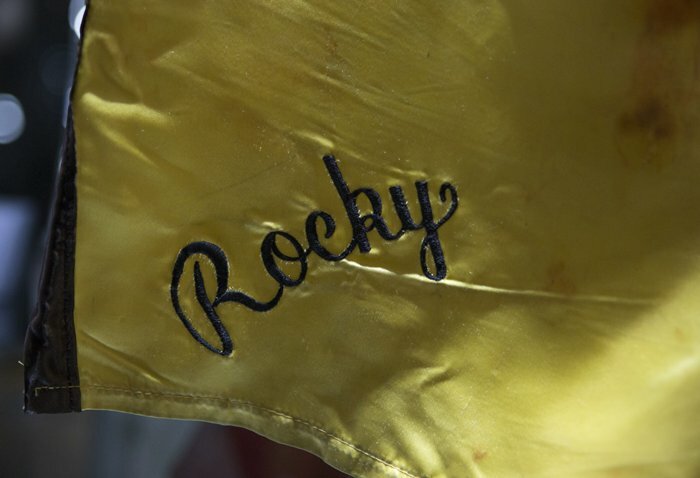 From the Academy-Award winning 1976 film, “Rocky,” the black leather jacket he wore in his role as Rocky Balboa and Rocky Marciano’s boxing glove pendant trainer Mickey Goodmill (actor Burgess Meredith) gave to Rocky. The boxing gloves Stallone used as Rocky and the World Heavyweight Championship Belt he won in “Rocky II” in 1979, and Rocky’s “tiger” jacket worn in that film. Fans can also bid on costumes and props used by Stallone in “Judge Dredd” (1995), the recent “The Expendables” movies and Rocky’s Harley Davidson motorcycle that appeared in both “Rocky III” and “Rocky V” (1990). Public previews of all the auction items will be at the Hyatt Regency Century Plaza in Los Angeles, October 16 – 19, with the auction conducted there on December 18 – 19.